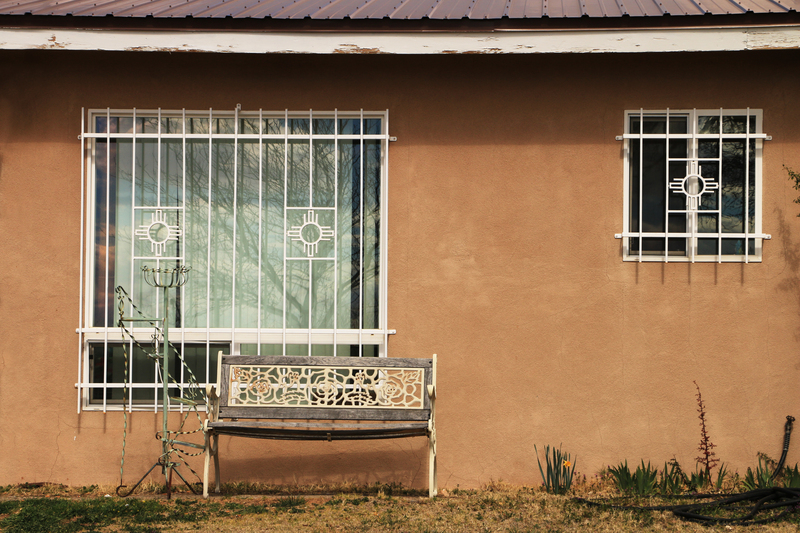 I like seeing human elements with oddities, like those seen here, along typical Albuquerque neighborhood streets. They provoke my curiosity about choices that people make that follow a logic unlike mine. When I made this image I was wondering: why is the bench and planter put in front of the larger window instead of under the higher window? Why would a single daffodil bulb (seen in bloom near the hose) be planted right there? On these window bars we see the sun symbol called the Zia. It’s the sacred symbol of the Zia Indians of New Mexico. It has been appropriated as the symbol on the New Mexican state flag. The four radiating points from the circle can be considered sun rays, or compass points. They also may represent the four seasons. According to Zia belief, there are four sacred obligations to endeavor: strong body, clear mind, pure spirit, caring for others.